Anyone know what this machine is? This picture is from the 1950s or 60s and was part of a collection of lookout photos. I'm trying to figure out what this machine is and what it might have been used for. It looks to me like some kind of motorized wheelbarrow. Re: Anyone know what this machine is? The more I look at it the less it looks like a machine. I think it's just a hand cart. All that stuff that looks like an engine is just boxes and bags of gear. Yup, definitely a motorized wheelbarrow. They have 4wd models now, and even ones with 'tank tracks'.. They're geared down and slow as hell though! I say that all the time too. I actually did a Google search and didn't come up with anything helpful. I was only finding modern motorized wheelbarrows, which didn't help me figure out what the thing in that old picture was. Thanks for that article. Interesting! Its actually called a merry packer. I still have one on the district. In that photo they sure make it look like the motorized version takes as much human muscle as the old fashioned kind. Chase wrote: In that photo they sure make it look like the motorized version takes as much human muscle as the old fashioned kind. I'm sure it did! I once spent a trail-crew day wrestling with one of these all day. I've never been more tired or sore at the end of a trail work day. Of course I accomplished a lot more than I could have with a normal wheelbarrow--I was in high gear, keeping up with a digging crew of about a half dozen and moving the dirt 100+ yards uphill. These things make your work more productive, not easier. 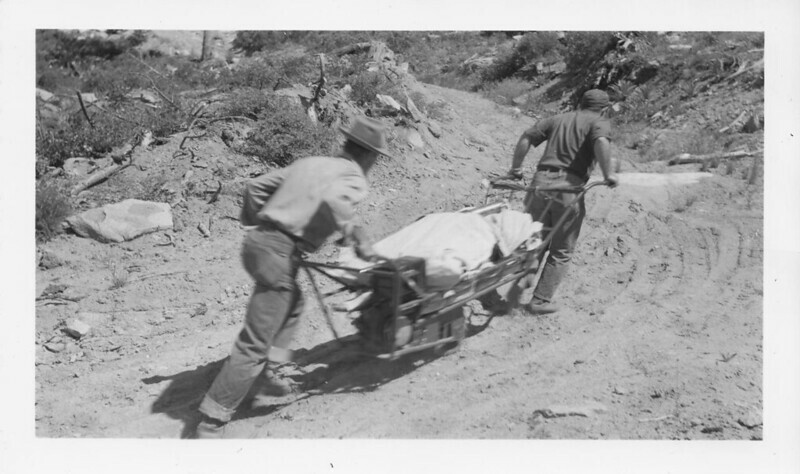 The Merry Packer was developed in the 1950's (by a man named Merry) and, by 1960 or so, was in regular use in trail work, at least in the West. It featured a small gasoline engine. Like a bicycle, a chain on a sprocket connected the wheel with the drive shaft. It had a throttle on one handlebar and a dead man clutch on the other. It was about as simple as simple gets in terms of a motorized conveyance. Although the referenced article claims it could haul 250#, it could easily tote twice that as long as the grade wasn't too steep and the tread too gnarly. It could go over fairly rough and rocky trail much better than the modern tracked carriers as the single ATV-like wheel could be guided around obstacles in the tread. It was geared low and could go up the steepest grade, not unlike the Rokon motorcycle. Despite that, it could go as fast as you could walk. Being narrow in width, it could go on very narrow trail, and with only a single wheel, it could negotiate trail with significant side slope. In these ways, it was superior to modern tracked carriers. It had a tubular steel frame with a bottom basket of steel strapping, not too unlike a Stokes rescue litter. A plywood box could be placed in it to haul soil or crushed rock. It did require two people who knew how to work together. The person in the rear had most of the control and the person in front guided the machine around obstacles. As seen in the photo, the load must be well balanced and kept well balanced for things to work right. The Merry Packer was temperamental in terms of going out of adjustment and throwing chains. It was a pain to work on. And it appeared to be garage designed and built rather than factory. Whenever it was staffed by novices or by individuals who simply couldn't get the hang of what it meant to work cooperatively with another person, the machine would work both of them to death. If the two people could work together well, and the load was reasonable, it the made the work easy. It was also sometimes dangerous, as the person in front was captive between the handlebars and could thrown over the side if the machine abruptly lost its balance with a heavy load.